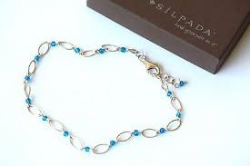 Retired Silpada sterling silver beads and links in a stretch band. Fastens with a circle clasp, 9 1/2" long. Can be found in the 2003-2004 catalog page 31. In excellent condition. 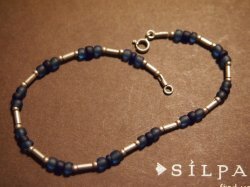 Retired Silpada Has light and dark blue beads with sterling silver on a stretch band. Fastens with a circle clasp, 9 1/2" long. Can be found in the 2005-2006 catalog page 30. In excellent condition. Retired Silpada with sterling silver on a 9 1/4" long with a lobster clasp. Can be found in the 2011-2012 catalog page 82H. New for $42.00 In new condition. 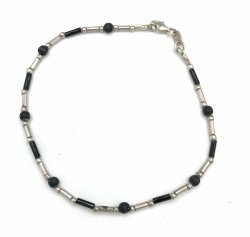 Retired Silpada Has black beads with sterling silver on a stretch band. Fastens with a circle clasp 9 1/2" long. Can be found in the 2005-2006 catalog page 30. Retired Silpada Has sterling silver on a stretch band. Fits up to a 9" ankle. . In excellent condition, former display item. Note this is an earlier edition, with circle clasp, not lobster. 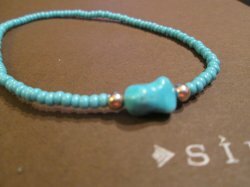 Silpada sterling silver and blue beads with an adjustable lobster clasp, fits up to a 9 1/2 inches ankle. Can be found in the 2007-2008 catalog page 53S. In new condition. 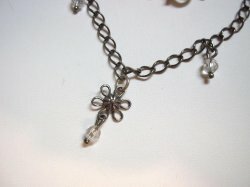 Silpada sterling Silver retired charms of a daisy like flower and several glass beads, Ankle bracelet. fits up to a 9 1/4" ankle with an adjustable lobster clasp. New for $29. Can be found in the 2009-2010 catalog page 39. In excellent condition, former display item. Retired Silpada with sterling silver on a 9 1/4" long with a lobster clasp. In new condition. Silpada sterling silver post earrings. They are 1/2 inches long. Can be found in the 2000 catalog, page 13. In excellent condition. Earlier item, no hallmark, picture is from catalog. Silpada sterling silver wire earrings. They are 1 inches long. Can be found in the 2000 catalog, page 13. In excellent condition. 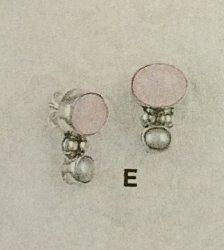 Earlier item, no hallmark, picture is from catalog. 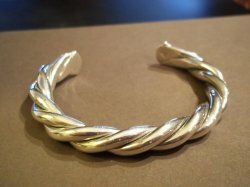 Silpada bracelet has unique twisted design, it is .925 sterling silver in a cuff. It can be found in the 2008-2009 catalog page 32C. This is a heavy bracelet, well made piece, in like new condition, former display only. 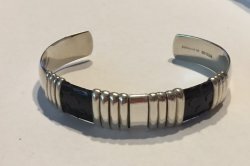 Retired Sterling Silver, leopard print Bracelet, . Fits up to a 7� wrist, has a toggle clasp. In the 2003 catalog page 19. In beautiful condition. 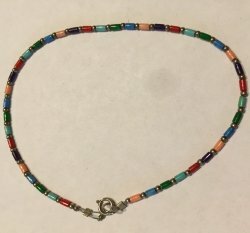 Each is unique and special, pictures shows the item for sale. 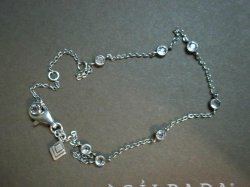 Silpada sterling silver beaded bracelet with a toggle clasp and a safety chain. Fits up to a 7 1/2" wrist. Can be found in the 2010-2011 catalog page 35G. In excellent condition, table piece only. 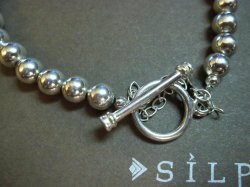 Silpada sterling silver beaded bracelet with a toggle clasp and a safety chain. Fits up to a 7 1/2" wrist. Can be found in the 2010-2011 catalog page 35G. IN EXCELLENT CONDITION, BUT IS MISSING SAFETY CHAIN. 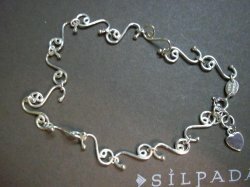 Silpada sterling silver features a oxidized interwined design, it is 7 3/4 inches long with a box clasp. Can be found in the 2001 catalog, page 11K. Former display item in excellent condition. This is a very rare piece in beautiful condition. 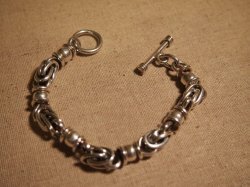 Silpada sterling silver beaded bracelet with a toggle clasp and a safety chain. Fits up to a 7 1/4" wrist. Can be found in the 2004 catalog page 35G. In excellent condition. 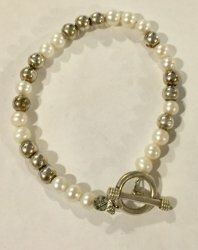 Retired Silpada sterling silver and freshwater pearls on a beaded bracelet, 7 1/4" long with a toggle clasp. Can be found in the 2010-2011 catalog page 80C. In excellent used Condition. Display only. 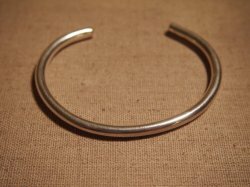 Silpada sterling silver cuff bracelet. In the 2005-2006 catalog page 21J. In excellent condition. Sterling Silver with Black leather decal cuff bracelet. Early piece no silpada arrow. Very nice piece. 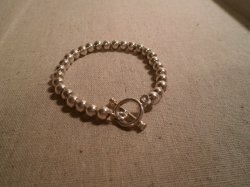 Sterling Silver Beaded Bracelet, has a Box Clasp and a safety chain. Fits up to a 7" wrist. In the 2010-2011 catalog page 79E. In excellent used condition. 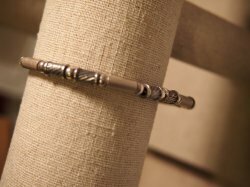 Handcrafted in Israel, this polished and matte sterling silver bracelet, it is 7.5 inches long. Last in the 2002 catalog page 19. In excellent condition. 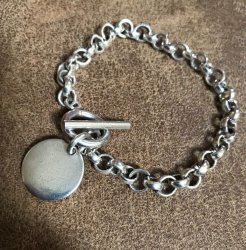 Vintage 2002 old school heavy Sterling Silver Rolo Link Engraveable Disc Charm Bracelet. Pre-owned in excellent condition. 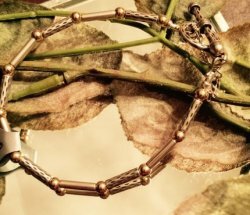 "This simple but stylish bracelet features a silver pendant, perfect or left untouched for a sleek look. Also makes a great charm bracelet. 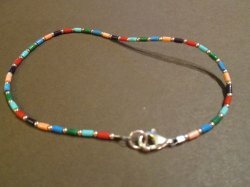 7 1/2 inches long with toggle clasp." Featured in the 2002-2003 Silpada catalog, Page 27.